This month I was assigned Allison’s blog, Sweet Flours. I really enjoyed going through her blog. The pics are wonderful and the recipes all so delicious sounding. I had a hard time picking one to try… Would it be the Hearty Winter Vegetable Pilaf? Or Lime Glazed Coconut Snowballs or the Buckeyes? Or maybe, after all the holiday indulgences, I should whip up some Green Monster Smoothies? She has a passion for pumpkin (I love me some pumpkin) and those recipes kept drawing my back. As I wanted one that could be used for the holidays, I finally decided on the pumpkin granola. I know, doesn’t really sound like a holiday thing, huh? I made it because it sounded delicious, but I also think this would make a great gift from your kitchen in a jar, all wrapped up for Christmas. A tasty, healthy treat to share! The pumpkin granola is not too sweet at all, which we really loved. My kiddos were sneaking bits off the pan before I got a chance to put it away, and begged to have it for breakfast the next day. That, my dears, is a successful recipe! After I made it the first time, I tweaked it a bit for our tastes and the recipe below reflects that. I can’t use one of the cereals due to our allergies, which I think adds a bit of sweetness, so I bumped up the maple syrup and vanilla a bit. I think adding dried apricots or dried cranberries after it cools would be a lovely addition. Gotta try that next! Thanks for the recipe, Allison! I can’t wait to come back an try some more things from your yummy and beautiful blog! Preheat oven to 350 degrees F. Mix the oats and rice cereal in a bowl. In a separate bowl mix the pumpkin, applesauce, maple syrup, vanilla, pie spice and salt until smooth. Combine the wet with the dry ingredients, mixing until well coated. Spread mixture into a rimmed baking sheet lined with a Silpat or parchment paper. Bake for 15 minutes. Stir mixture, breaking apart larger lumps. Sprinkle pepitas and brown sugar over mixture. Put pan back into oven and bake for 20 more minutes until golden and crispy. It will get more crispy as it cools. Optional idea: After granola cools, mix in chopped dried apricots or dried cranberries. Oh yum. Seriously - pumpkin granola - I've never even thought of this before. This sounds so good!! I don't blame your kids at all for sneaking bits off the pan! I would be doing the same - it looks delicious! Looks delish! I love making granola and pumpkin is one of my favorite flavors! I've never made granola before, but this post has inspired me. Looks delish! I've made regular granola before but never pumpkin granola. I just know that I would love it! I have been wondering if my kids would like pumpkin granola. I am going on your kids' recommendations and will definitely be trying this. Looks delish. I've been wanting to make some granola... and I should! Have a great day! This would totally be a great homemade gift this time of year! love this SRC post! I've been wanting to try a granola recipe and this sounds like a great one. Yay SRC for helping us try new things. Truly a successful recipe for you. The granola looks great!!! I am so glad you found something on my blog for both you and your kids to enjoy. I can't wait to pour through your blog. My hubby has become a granola fanatic in recent days. It's so expensive that I've been collecting a few granola recipes to test out on him in the near future to cut down the expense. 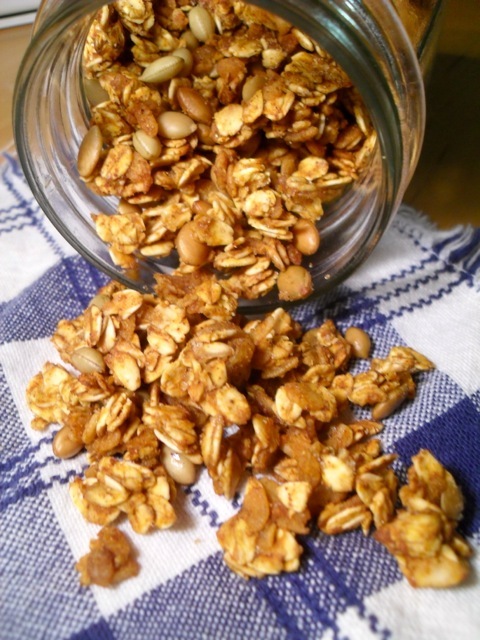 mmmmm, pumpkin granola with maple, yum! I never imagined pumpkin puree in granola, but it sounds delicious! Lovely blog!